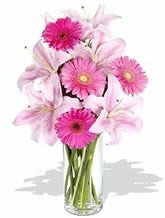 A beautiful bouquet of aromatic Oriental Lilies and chirpy Gerberas makes this the perfect choice.Vase not included however, for a lasting impression we recommend including a Premium Vase as the ideal addition to Beautiful. Easy to order, arriving on and fresh thank you . I had ordered flowers last year for my mothers birthday. I was very happy with the service then.. I received an email saying I had ordered flowers this time last year for a birthday. It had included what they card should say similar flowers and everything. It made it very easy and simple.. I did order again and very happy with the fast delivery and quality of flowers. My mum loved the BIG thanks for everything very happy and will order again.. Excellent service. We send flowers from Perth to Christchurch a few times a year and they are awesome. 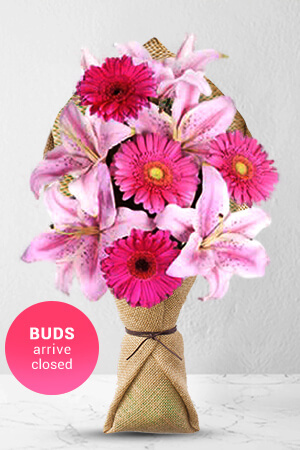 Prompt arrival of flowers and great reminder service, very helpful and easy to reorder.